Dover "Collector" Ragnes rides with only five brothers at his back. Nomads with no place to call home, they never stay in one place too long. Together, they are the Devil’s Due MC, and their only purpose is to serve justice their way for unsolved crimes everywhere they go. SPECTACULAR book from beginning to end. Dover ‘Collector’ Ragnes rides with his brothers and they make up the Devil's Due MC, nomads without a location to call home by choice. They mete out their own form of justice for unsolved crimes and each one have one that needs justice. Up first we have Dover looking for a man from his past who took something he cherished and never let go of. Never once did he think that the lead he followed would lead him to a woman connected to his past and that the chemistry between the pair would be so COMBUSTIBLE. Emerson Flint will always remember her best friend who was taken too soon, so leaving behind a mother who held on too tight she decides to forge ahead and make a life for her self not knowing that past will find her unknowingly. This was a dynamic start to what would ultimately be a fantastic series. Each man in the Devil's Due MC has a tale that will undoubtedly be solved with their form of justice. My advice is to strap in and hold on tight and prepare for a HELLUVA ride, best believe I will be there every step of the way. The synopsis to In the Red definitely caught my eye. 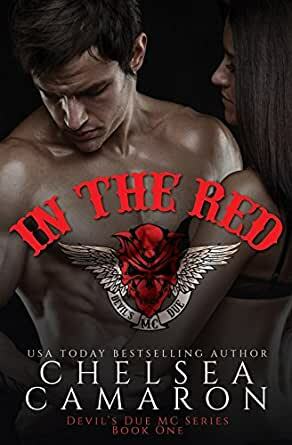 The biker romance genre is a favorite of mine and I especially love it when someone interjects a new little twist. For this book, a group of nomad bikers who have all suffered some sort of tragedy in their past band together and travel around the country to solve cold cases. A tragedy of epic proportions connects Dover and Emerson. Dover’s sister was Emerson’s best friend and was kidnapped and brutally used and murdered by a serial killer when she was nine years old. For Emerson, it meant her parents made a prisoner out of her with their need to be overprotective of her. This caused her to leave home as soon as she could. For Dover, it meant a lifetime of guilt since he felt responsible for his baby sister’s death, eventually causing him to leave too. Emerson ended up a tattoo artist, Dover ended up a member of the Devil’s Due, meting out vigilante justice whenever he can. I had a hard time with Emerson. I can’t imagine the horror of being nine years old and having your friend brutally murdered. I also can’t imagine still wallowing in your misery years later. It was like no healing ever took place for her, even after she escaped her mother’s smothering ways. I did understand Dover. He let what happened to his sister shape his life but in what could be considered constructive ways. First, he became a cop and then when he realized how often justice falls down on the job, he became a vigilante. Although still broken because of his crushing guilt, he was at least trying to make the best of a bad situation. I am firmly in the camp of being just fine with insta-love books as long as it’s done right. I’m not sure Emerson and Dover fell in that category. The chemistry was there but these two had so much baggage and so much antagonism towards each other at first, it just didn’t seem believable to me. A lot of coincidences needed to be looked over in this book. A big one is that Dover, Emerson, and the killer all end up in the same town. Another is that Emerson just happens to end up being mentored by a man who Dover’s MC considers a good friend, if not a father figure. I found myself having to suspend belief too many times which was a disappointment. I found the members of Dover’s MC interesting even if they all had a habit of saying things that sounded stolen from fortune cookies. Don’t get me wrong, bikers can definitely get deep, but these guys could have passed for biker monks with seriously foul mouths. I had to make a conscious decision to find this funny instead of annoying. I thought In the Red was a decent read with an interesting plot. With more character development and time to really flesh things out, I think this would have moved to the really good read level. What an amazing start this book was for a new series. As soon as I started to read the prologue I was completely hooked. This book deals with dark and harsh situations, ones that left me reeling and left me completely broken. But through the darkness in this book there is also so much beauty and promise in the form of love. When family, friends, neighbors and a town are left with more questions than answers after a heinous and shocking crime, no one would ever be the same. Darkness, emptiness and anger are what is left of a brother and best friend, trying to move on in life, never forgetting that tragic day. After the loss of his little sister Dover (Collector) has never been the same. He lives with so much guilt from that tragic day. The day that he was left to watch her and he failed. It broke my heart when he would have flashbacks of their past as children. There is pain so deep and profound within Dover that it bleeds off the pages. He tried to live his life but never forgot his sister, and never truly was at peace. Never knowing what really happened has left a permanent hole in his heart and his life. Years later he is part of a Nomad chapter of the Devil’s Due MC. Collector and the 5 members of the MC travel the country with one goal, to serve justice on all the unanswered crimes. Collector has never returned to his home town. That is until a case brings him back. After losing her best friend Emerson’s world crumbled. She not only had to mourn the loss of her best friend, but her parents also lived in fear of the unknown and her life and home changed drastically. It is understandable the level of fear her parents lived during that time, but Emerson was literally a prisoner. Once she is able to leave home Emerson, leaves and never looks back. She adopts a new name (Sonnie) and has a talent as a tattoo artist. She befriends a man who takes her in and becomes her adoptive father. I loved the little things Emerson constantly does in honor and remembrance of her best friend. Emerson has a tough exterior but you can tell the past dictates her life. When her past comes walking through the tattoo shop her first instinct is to run. Dover was so perfect for me. He is damaged and he knows it but seeing Emerson again sparks something in him, something that has been missing for years. I love that he is a total alpha when it comes to Emerson. He knows they share the same pain and loss, he knows she is hiding herself from the world, but he is not letting her hide from him. Emerson was an amazing female lead, feisty and strong and did she did not back down. Emerson sees the guilt in Dover’s eyes and she wants to help ease his pain but she never expected to fall for him in the process. Will Dover and Emerson, finally bring Raleigh’s killer to justice? Can they find peace and love in each other? The Devil’s Due member’s each have their own story to tell and are vowing justice for something that happened to them. I really loved the sense of loyalty and brotherhood they shared. Their friendship and bond help them seek justice for those who never were able to get closure. Dover and Emerson each have to fight through their pain and find a way to seek justice for Raleigh while making peace with her loss. This book is extremely touching, some of the topics detailed were hard for me at times but those parts delivered an incredible profoundness and sense of realness in this book. The characters and plot were written so well, and this story touched my heart in more ways than one. I really enjoyed the first installment in this series and look forward to seeing each member get the justice they deserve. New series about six men whose souls were all gutted by some tragedy in their past where justice wasn't served by the law. These men all came together to form the Devil's Due – their own personal MC club that doles out their own private justice giving the devil his due. First up is Dover ‘Collector’ Ragnes. He was quite a bit older than his sister Raleigh, but she was still the sun and moon to him. When she goes missing on his watch when he was a teenager and turns up days later dead after being sliced up and raped he vows to spend the rest of his life finding the man responsible. Emerson Flint was Raleigh's best friend. The two were thick as thieves growing up and had plans to always be friends no matter what. When Raleigh died not only did she loose her best friend but she also lost her freedom as her mother was so scared that something would also happen to her she suffocated her. As soon as she turned 18 she left town and never looked back. Now its many years later and fate has put Dover and Emerson in the same town. Him and his men following up on a lead that the man that might have killed his sister is in town and Emerson the tatoo artist working in a shop where the team end up looking for new tattoos. Dover and Emerson both still walk with the ghost of Raleigh on their souls. Emerson does it in a healthy way as opposed to Dover's self imposed guilt he wallows in. This was a nice change from the typical MC troupes out there. These guys are not a typical MC – they have no homes – just roam from town to town meting out justice. Its obvious the other 5 men all have their own demons they are living with and I look forward to finding out what those are in future books. No cliffy here either – justice for Raleigh was served at the end of this book in a most satisfying way.